Advances in triple quadrupole technology is boosting LC-MS/MS performance, helping labs test faster and smarter. Detection and quantitation of pesticide residues in food is extremely important in food safety. Given the challenge of evaluating multiple pesticides at low levels across various samples, laboratories are in constant need of robust, reliable and sensitive analytical methods. The risk of unauthorized pesticide overuse can increase residue concentrations in food, thereby, causing severe health issues. Global food safety bodies strictly regulate the levels of pesticides allowed in food products. In the European Union for instance, legislation in the form of Directive No 752/2014 sets statutory maximum residue limits (MRLs) for more than 1000 pesticides in food products of plant or animal origin.1 The number of pesticides and their allowed concentrations are necessary to ensure consumer safety, and are amongst the strictest in the world, permitting concentrations in products at levels typically as low as several parts-per-billion (ppb). The requirements to achieve such low limits of quantitation for all analytes in a complex matrix present a significant analytical challenge for the food safety laboratories tasked with making a confident assessment of every sample. With perishable products such as fresh fruits and vegetables under routine analysis, these results need to be achieved within very short turnaround times and at a low cost per sample to meet lab managers’ budgets. Recent advances in triple quadrupole technology have offered an additional boost to the existing analytical capabilities of liquid chromatography tandem mass spectrometry (LC-MS/MS). The segmented quadrupoles, faster rod drivers and more powerful electron multipliers can enable analysts to achieve the desired levels of robustness, mass accuracy, precision and sensitivity required to meet this challenge. Improvements in instrument detection capability are pushing the limits of quantitation even further. Figure 1 highlights the amplified sensitivity of a triple quadrupole spectrometer for the determination of two pesticides in a leek sample—a particularly complex matrix with a high moisture content. For both chlormequat and 2-methyl-4-chlorophenoxyacetic acid (MCPA), the spectrometer delivers enhanced performance, giving analysts the ability to quantify residues far beyond the current limits required for MRL determination. Figure 1. 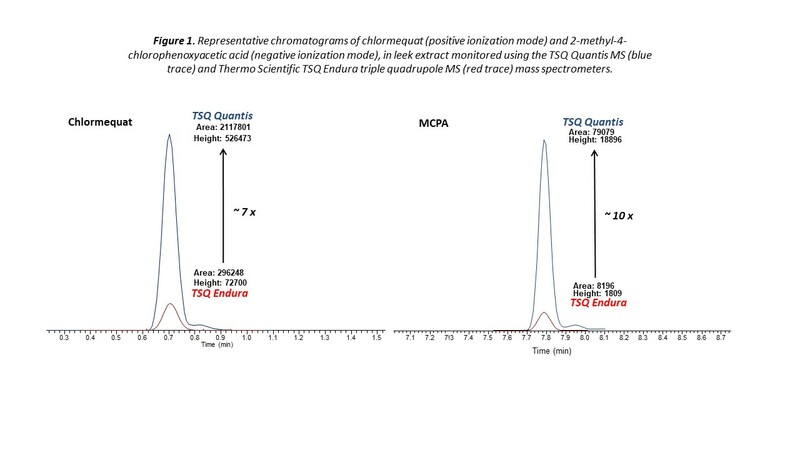 Representative chromatograms of chlormequat (positive ionization mode) and 2-methyl-4-chlorophenoxyacetic acid (negative ionization mode), in leek extract monitored using the TSQ Quantis MS (blue trace) and the TSQ Endura triple quadrupole MS (red trace) mass spectrometers. 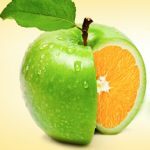 With potentially hundreds of perishable samples to analyze each day, food testing laboratories not only require the ultimate sensitivity, but sensitivity should be supported by speed and robustness. One way in which analysts are achieving higher analytical throughput is through the use of shorter instrument dwell times. Although short dwell times in the past enabled productivity of sample analysis (more samples at the same time), they often came at the expense of robustness and sensitivity of the results. With the latest advances in triple quadrupole technology, short dwell times no longer compromise analysis. Very effective quantitation of pesticide residues can be achieved using timed selection reaction monitoring (SRM). With the timed SRM approach, data acquisition is performed within a short retention time window around each compound of interest. This approach reduces the number of transitions that are monitored in parallel within the retention time window, while ensuring consistent quantitation even at low concentrations (see Figure 2). Figure 2. 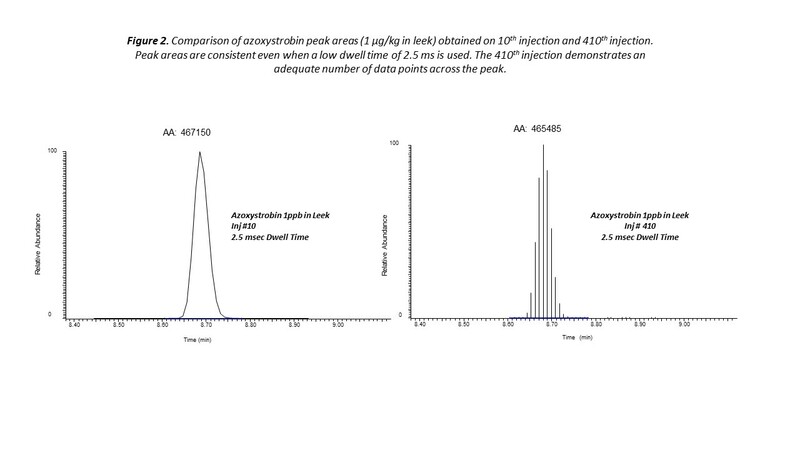 Comparison of azoxystrobin peak areas (1 μg/kg in leek) obtained on 10th injection and 410th injection. Peak areas are consistent even when a low dwell time of 2.5 ms is used. The 410th injection demonstrates an adequate number of data points across the peak. Another important point to consider is workflow robustness. For busy laboratories with large workloads and tight turnaround times, time-consuming daily instrument recalibration and frequent maintenance simply isn’t a viable option. Triple quadrupole instruments are renowned for their experimental reliability that is delivered for every fast-paced environment, and the latest instruments are pushing expectations even further. Figure 3 demonstrates the precise levels of measurement reproducibility that can be achieved using a triple quadrupole MS. Peak areas for the pesticide residue atrazine, added to a leek sample at a concentration of 10 μg/kg, remained well within the expected ±20% range over 400 injections. Even when the system was placed into standby mode for 12 hours and subsequently restarted, consistent measurements could be obtained without any additional maintenance. Figure 3. 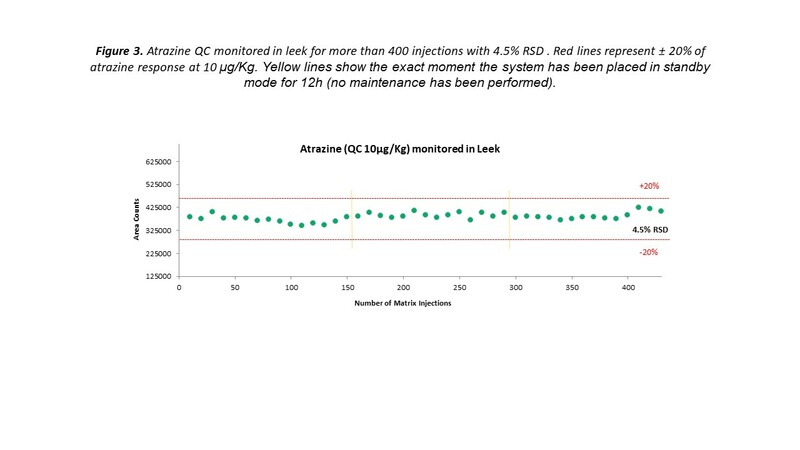 Atrazine peak areas (10 μg/kg in leek) monitored over 400 injections. Red lines represent ±20% atrazine response. Yellow lines show the point at which the system was placed in standby mode for 12 h. No system maintenance was performed between injections. Technical advances in instrumentation and improvements in procedures have generated more robust LC-MS/MS processes to definitively detect trace pesticide residues. With limits of quantitation growing increasingly stringent year on year, such advances in technology are not only helping laboratories meet the quantitation challenges of today, but also prepare for those of tomorrow. 1. Commission Regulation (EU) No 752/2014 of 24 June 2014 replacing Annex I to Regulation (EC) No 396/2005 of the European Parliament and of the Council, 2014. This article is based on research by Katerina Bousova, Michal Godula, Claudia Martins, Charles Yang, Ed Georg, Neloni Wijeratne & Richard J. Fussell Thermo Fisher Scientific, Dreieich, Germany, Thermo Fisher Scientific, California, USA, Thermo Fisher Scientific, Hemel Hempstead, UK. Using LC-MS/MS tech and advanced sample prep techniques like QuEChERS will help labs stay on the cutting edge. 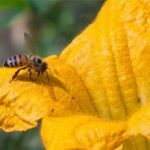 A recent poll indicates that Americans want bee-killing pesticides out of agriculture, but several food retailers received an “F” for their lack of pollinator protection policies. 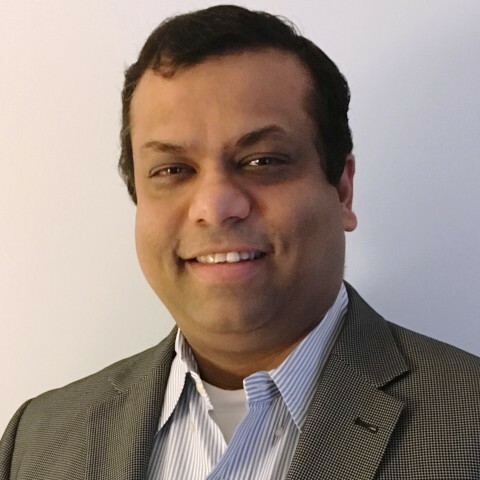 Debadeep Bhattacharyya, Ph.D. is the senior manager of product marketing (Triple Quadrupole MS) for all businesses in the applied market division at Thermo Fisher Scientific Inc. With more than 12 years of experience working with mass spectrometers and other high-end analytical instruments, and also with customers across varied industries and academic institutions, Bhattacharyya applies his expertise and the experiences he has gained in working with customers and ensuring their scientific and business success. He also works closely with scientists, business development personnel, regulatory bodies, and key opinion leaders to address the need of mass spectrometer (specifically triple quadrupole) users. Bhattacharyya received his Ph.D. in chemistry and biochemistry from Emory University (Atlanta, GA).